Do you have a lot forms and surveys? We’ve added some new features to our Home page that should make your life easier. You can now sort all of your forms by name, create date, or number of results. We’ve also added a slick new “Filter” box that enables you to filter your form list as you type. So, if you type “HR Department”, you will only see forms with “HR Department” in their names. Have you ever needed to collect a variable number of names or answers, but without cluttering up your form with a lot of fields? We’ve got a new Text List item that gives you the ability to collect a list of answers, but only shows one to start. To expand or contract the list, the user simply clicks the +/- buttons. This way, the user can enter exactly the number of answers they need to. We now provide a way to override the status of a result. You can change the status to any value you would like. Previously, if a status was “Incomplete” there was no way to change it. Now you can change it to “Complete” or any of our other valid statuses. To change the status, move your mouse over the status and select a new status from the dropdown that appears. The Order Total value of an Order Form is now available to be piped anywhere piping is supported. Use the pipe code "order_total". If you have a multiple page form, you can now display a running total from the previous pages. You can now configure Notification emails to be sent when results are edited within Formsite. This enables you to better integrate a workflow involving multiple people. You can define one or more Notifications to be sent on initial completion of the form and then an entirely different set of Notifications to be setup when results are edited. Before this feature, many users would manually send out an email telling others a result was edited, approved, etc. Now you can have it done automatically! We’ve added new Publish options that make it easy to quickly share your form on Facebook or Twitter. Now you can rapidly get the word out about the great new form or survey you have created. Ok, let’s just say we are very excited about this. The big news – you can now repeat a page X times based on a user’s response. For example, say you have a league signup form and there may be up to X team members on a form. You can now repeat a “player info” page X times based on how many players are being signed up. Previously this was possible, but it required detailed Item and Page Rules logic setup that was time consuming to setup and prone to mistakes. 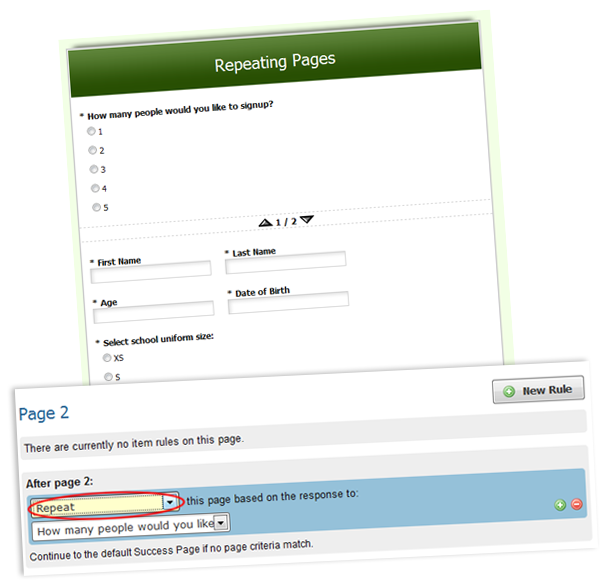 With our new repeating page logic, you simply designate that a given page will repeat X times based on the answer to a previous question. This makes setting up forms that require varying amounts of information very easy. We have a couple of templates made to help you get started. We have dramatically improved our embedding feature that enables you to embed Formsite forms into other web pages. Whether your form is single page, multi-page, an order form, or a password protected form, you can embed it and it will look great! We have done extensive testing across all browsers so no matter what browser your user is using, the embedded form is going to look great within your web page. The embedded form code is designed to take 100% of the space of the container that you embed the form in. Put simply, it is now even easier for you to embed your form into your page and it will look great. 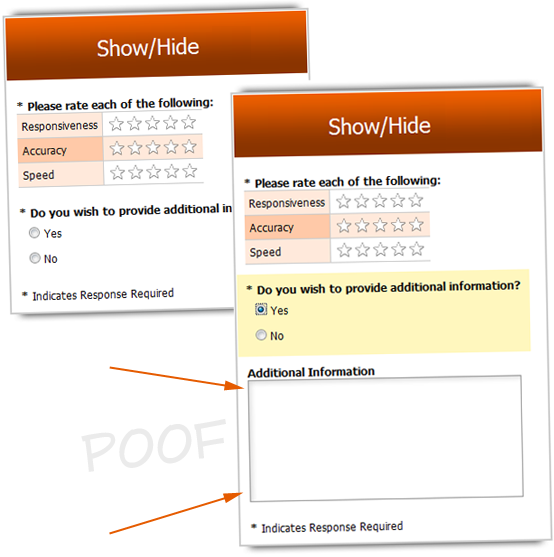 Ever want additional questions to magically appear on your page based on how your user is completing your form? Many of our users have asked for this feature and we have added it. You can now choose to show/hide items on a page based on how items on that same page have been answered. For example, someone could check a box saying they will “provide additional detail”. Upon checking this box, a field appears to collect the additional information. You may want to use this feature to make a form look less intimidating by showing far fewer fields initially, As the user completes your form, more fields will appear. 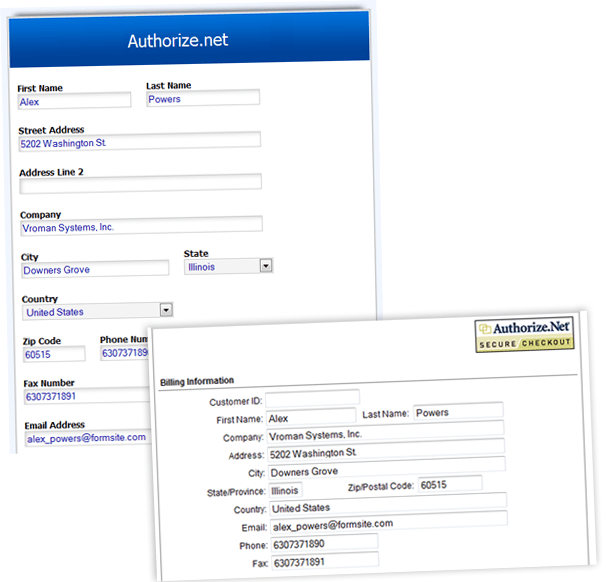 Our Authorize.net integration now enables you to map name and address information collected on your form into Authorize.net’s secure payment form. This eliminates the need for the user to enter the same information twice if you happen to be collecting the name and address on your form. This is long overdue and it was a bit ridiculous that a user would enter an address at Formsite only to have to turn around and provide the same info to Authorize.net.